Do you remember the last time you reached your physical limit? Think about it. That point where you don't think you can move another inch; utterly exhausted. Now think back to when you've felt the same mentally. There is nothing but negative thoughts, and you feel like you are at the end of yourself, unable to go on. The beauty of bike racing is that you can reach both your physical and mental limits simultaneously. There simply are not words that can accurately represent the level of pain this brings to feel both mentally and physically empty. The beauty in it is this: when you find the absolute end of your physical and mental strength, you can either give up or go on. If you choose to go on, you have not only denied the pain but you have destroyed your limits and extended them, you have become more than you were. The Hilly Billy Roubaix was just another opportunity to crush or be crushed by old limits. 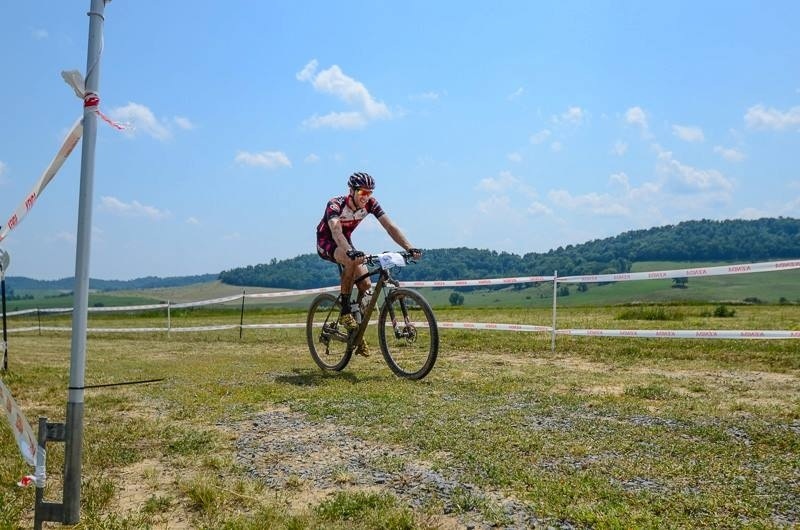 Staged on the top of a mountain outside Morgantown, West Virginia, the Hilly Billy Roubaix is a 74 mile race through the remote back roads of the wild and wonderful state. Gravel, pavement, and dirt make up the course which makes gear selection tricky. About 60% of the field opted to ride cyclocross bikes while the other 40% were on mountain bikes of some variety. At the end of the day, there was no right answer to "what bike" as Adam Driscoll and Gerry Pflug both did well on different bikes. The true question of the day became "Who can manage the heat well?" With temperatures in the upper 70's as the race began, it was on everyones mind. The race started like any other. Riders struggling for position before the first tight road, some proving they should be at the front as others melted away quickly. We hit the first gravel road and I realized I had not fought hard enough for a good position as I was immediately stuck behind several riders who were climbing slower than I preferred. Soon, I watched as the leaders climbed away in a group and I, left behind with the first chase group. I squinted up the road trying to count jerseys before losing sight of them over the next peak. 17? 12? I couldn't be sure. I concluded with confidence to be near the 20th position. The first few climbs had wreaked havoc on the field, blowing it apart into tons of tiny groups. With 256 racers, there were plenty of bodies for company. A group of 5 of us hit the first paved section together and began lurching our way towards the leaders, whom we knew we could never catch. Yet, we plodded on. A couple more riders joined our group as we went through some gravel and deep mud and by about mile 10 we were a group of 7. Lance Byrd, a teammate of mine on AFC, was managing well on his single speed mountain bike, and it was great to have a familiar face in the group. A few cx bike guys were pushing very hard on the road and on the climbs. After a few miles I checked my stats and found to have been averaging 181bpm for the first hour. Now, I might average 185 for a high speed, high effort cyclocross race that lasts 45 minutes, but for a long day of racing, this simply wouldn't work. Thus, I backed off the gas and let my group spin away on the next climb at mile 13. The key to endurance racing is to have a faster all-day pace than everyone else. I began settling into mine and was passed a few times by racers initially and at aid station 1 where I stopped for some extra water to cope with the heat. Each gravel climb was either a relief as it was shaded, or torment as it was exposed. The road sections weren't much better as they were fast which meant air on your face, but always sunny and hot. The miles ticked away slowly, but after 2 hours I'd gone 32 miles and climbed 3,200 feet. At this point the race was strung out. I could usually see someone in front of me or behind me, but groups were rare now. Each racer was at their own pace. Having someone up the road is helpful. It gives you a small goal to meet. When you're racing for hours on end, you can't just put in a little effort to bridge up, it must be a slow endeavor. Some liken it to reeling a fishing rod as you slowly pull them closer. I reeled in a few riders and we worked together a bit, trading pulls along the flatter sections. About that time I began to panic. I was running low on water and in my poor mental state forgot their were 3 aid stations. I began thinking about riding another 20 miles before getting more water and it was frightening. Just then, I saw Chris Holland who was out cheering a few of us on. He gave me all the water he had left in his nalgene for the whole day. That was a huge mental boost. Even after seeing Chris, when I saw Aid 2, it felt like a mirage. The heat was really getting to me as I hit mile 40. My core temperature was high and the more water I drank, the more sloshy my stomach felt. I resorted to pouring water in strategic areas of my lower half to try and cool down which helped. But in heat like that, you get to a point where you simply cannot physically hydrate fast enough. I was getting depleted, and with depletion, comes cramps. If you've never experienced a cramp before, it goes a bit like this. After fatigue or dehydration, you flex a muscle (typically when using it) and it freezes in place and sends an excruciating pain through the region. Sometimes you can "unfreeze" it, but sometimes you get stuck and fall off your bike. Leaving aid 2 I began climbing a mountain and felt the first twang of cramps forming in my quads. "This cannot happen" I thought to myself. "30 miles to go and cramps now?" I immediately ignored my stomach woahs and took in water until the bloated feeling was painful. I climbed on. About that time a single speed rider, Daniel Rapp, was about 100m up the road from me. He dangled there for a while, churning slowly up the climbs, methodical, consistent. I set to work to reel him in slowly, but it seemed an insurmountable task. I'd get him close, and he'd gap me again. A bit closer, and he'd outclimb me by a few seconds. It was hurting my morale, I just couldn't get him. The heat was oppressing my soul as my fingers were slick with sweat on my bars. Deeper and deeper I went into the darkness of suffering. I couldn't believe we still had another 30 some miles to go. How could I make it without getting heat stroke or simply collapsing? We passed creeks and rivers which added to the frustration as we plodded on slowly. Rapp and I picked up a few lifeless souls along the way, their gaze fixed on the ground, each pedal stroke looking to potentially be their last. The cramping had been staved off thankfully, but my legs were heavy now, and each climb saw me going slower than the one before. I glanced over my shoulder occasionally to see if anyone was coming up on me and the rabbit I chased, but the only sight was heat billowing off the pavement. It was a slight relief, but a stout reminder of the suns cruelty. Aid 3 came and it felt like Christmas. Rapp skipped it but I didn't care. I grabbed 3 full bottles, drank a bit of ice water, poured some on myself and got moving just in time to see 4 riders right on my tail. One of them, Mike Hosang, skipped the station and quickly was on my wheel. I think he could tell I was hurting and resonated my feelings. We suffered together as we climbed and climbed, hoping for the end. When you are in pain, knowing when it will be over is of great comfort. Unfortunately, I had forgotten to start my GPS at the beginning of the race, and in my delirious state couldn't remember how long it had been. That was the mental wall for me. My body was finished, overheated and obliterated by exhaustion. My mind had been steady until then. But when I was unsure of how far we still had to go, I broke. Being at the end of yourself physically and mentally leaves you searching for anything to cling to. I thought of my wife, prayed for her and our family, and everyone else I could think of to distract myself and keep pedaling. That really helped to get my mind back on track, but the legs still pleaded for the end. Every mile felt like 10 as we got closer and closer. Mike and I were checking behind us, waiting for the inevitable: a chasing group. Mike had fought hard to get where he was after overcoming two flats early in the race. I desperately wanted to stay ahead of the 3 over-forty category riders he had been with in Aid 3. We traded pulls and worked together as best as our tired legs could. Climbing a paved road, I looked around and thought I noticed something familiar, but brushed it aside as wishful thinking. Cresting the hill I practically yelled "Mike! that's the staging area!" We had made it. A quick high five, and we were pushing the pace to the final climb that lead to the finish line. Bike racing emulates life in a myriad of ways. It has emotional peaks and valleys, triumphs and defeats, moments of suffering and moments of glory. And through it all, being with someone else always makes it easier. The one way it doesn't reflect true life though, is that at the end, you have to outdo your friend. You see, Mike and I had been working hard together and suffering, but I knew at the end of that race, one of us had to cross that line first. Knowing we were close to the top 20 overall but unsure of our exact placement, that 1 spot could be the difference between 20 and 21. We hit the final section of climbing and I hit it as hard as I could. Taking a quick look back, I found that Mike was content with letting me get the next spot. To be safe, I cranked with all I had left, not wanting to feel as though I left anything out there. I crossed the line in 4:59:11 for 16th overall and 7th in my under 40 category. A result I was perfectly satisfied with. The beauty of bike racing, and the beauty of the Hilly Billy Roubaix, is the mental and physical limits that you find. You can crush them, or be crushed by them. It's your choice.